We have a penchant for big things in Aus – the Big Banana, the Big Pineapple, the Big Apple, the Big Merino (sheep), and even the Big Prawn. 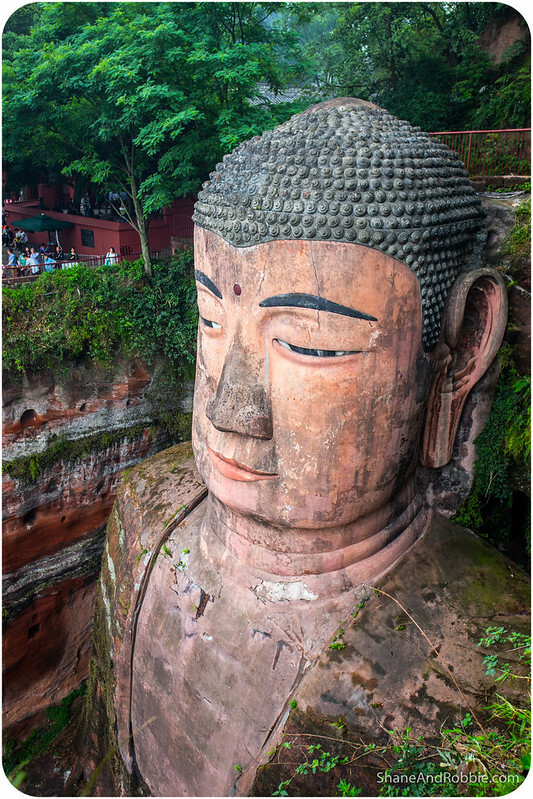 Leshan’s Giant Buddha is far more impressive than any of our BIG things however; this 71m stone statue was carved out of solid rock in the early 8th century and has stood watch over the town of Leshan every since. With fingernails bigger than us, this colossal carving was very impressive and left us feeling quite awed. 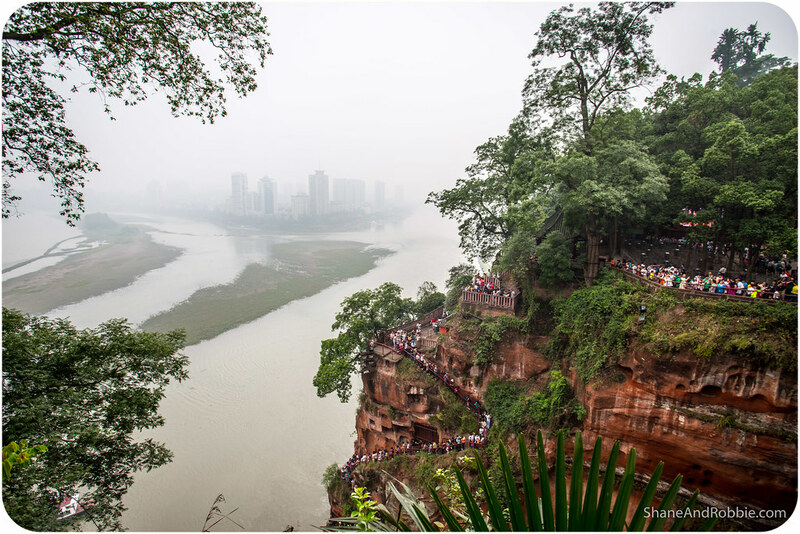 As awe-inspiring as Buddha was, the crowds in Leshan were even more incredible. 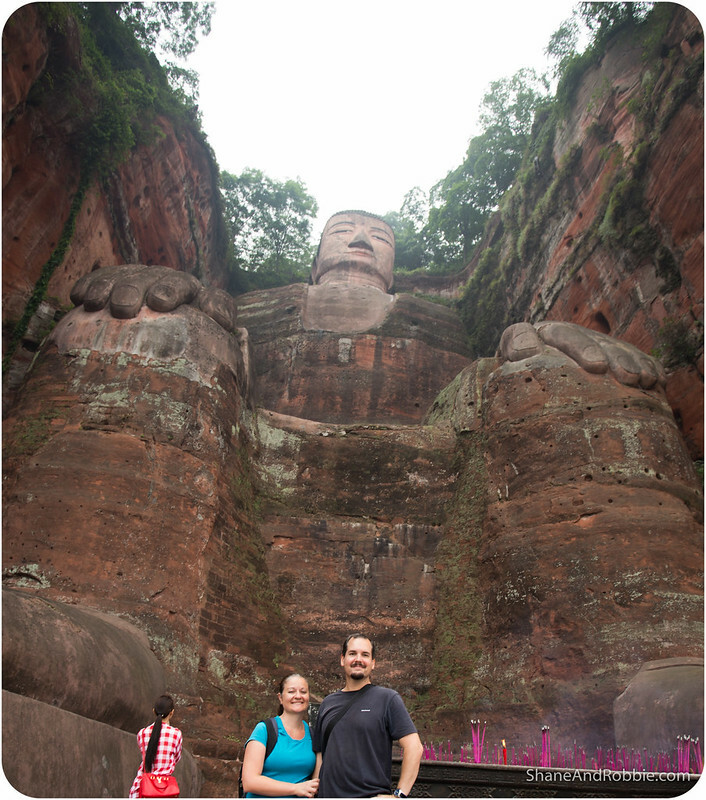 Turns out today is Buddha’s birthday, which meant LOTS of people were out visiting Leshan’s Giant Buddha. 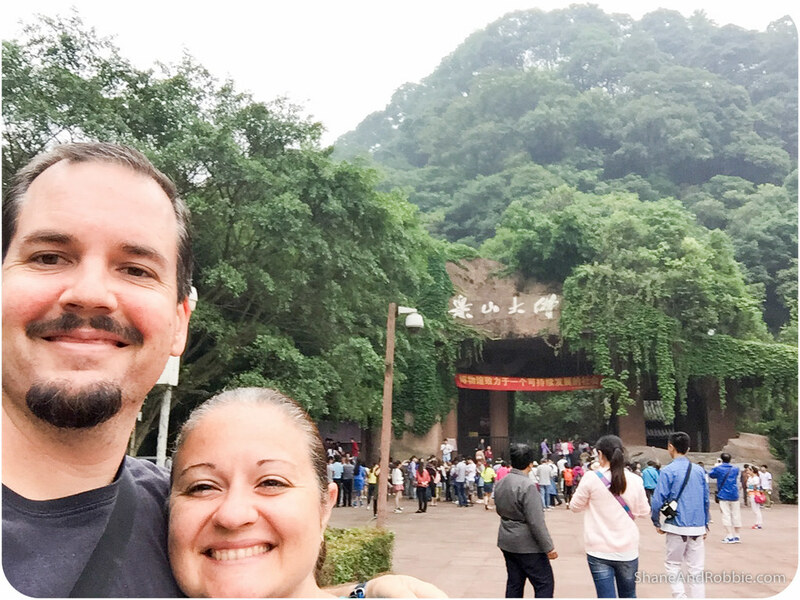 We left Chengdu quite early, but due to the hectic Monday morning traffic, it took us 3 hours to travel the 120km to reach Leshan. This meant that by the time we got there, bus loads of Chinese tourists had already descended and we were at the back of a long queue of Chinese tour groups and their loud-speaker wielding tour guides. 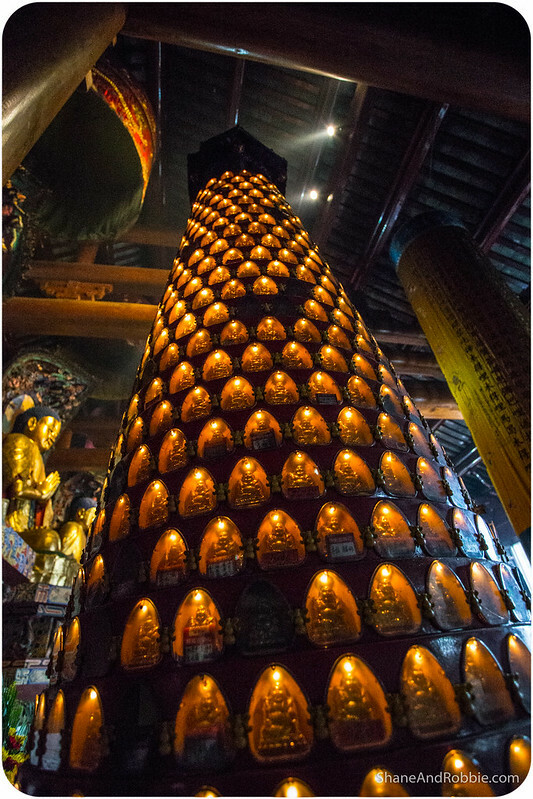 The Giant Buddha is the tallest statue of its kind in the world. 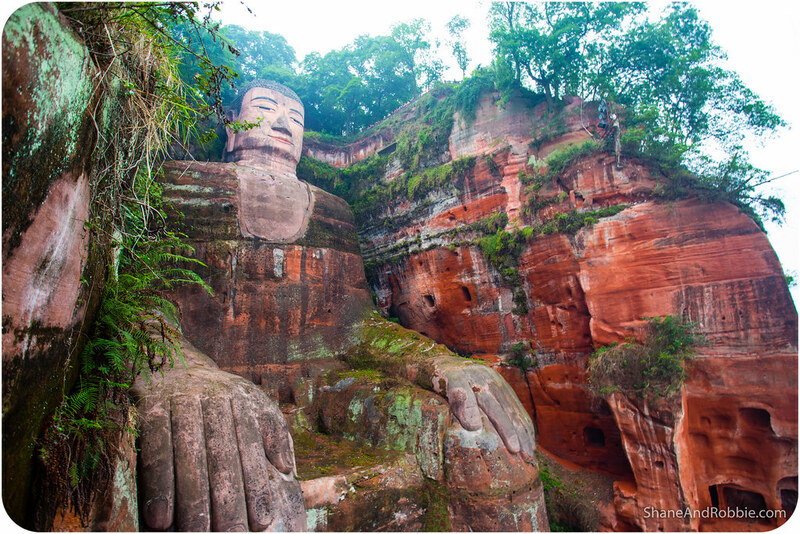 Carved directly out of a small mountain, on the riverbank facing the town of Leshan, this monument depicts a Maitreya* Buddha sitting with his hands on his knees. 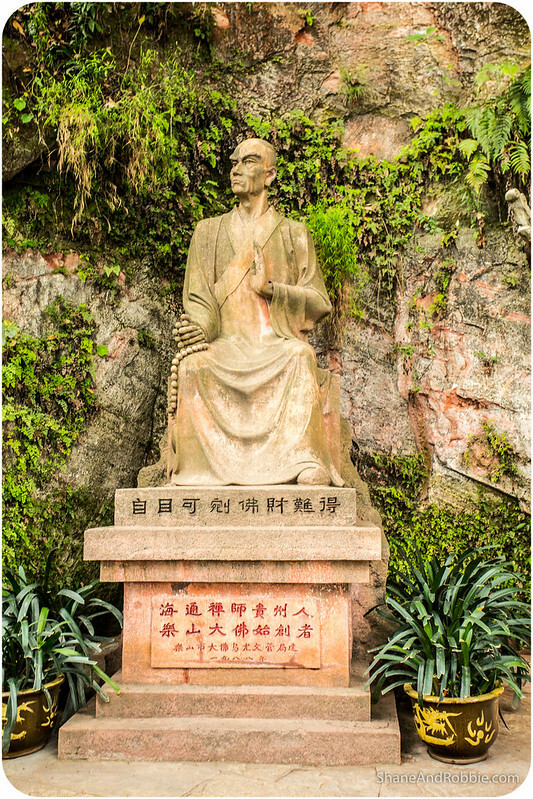 The statue stares benevolently out over the confluence of the rivers Minjiang, Dadu and Qingyi, protecting Leshan from floods as he has done for 1,200 years. 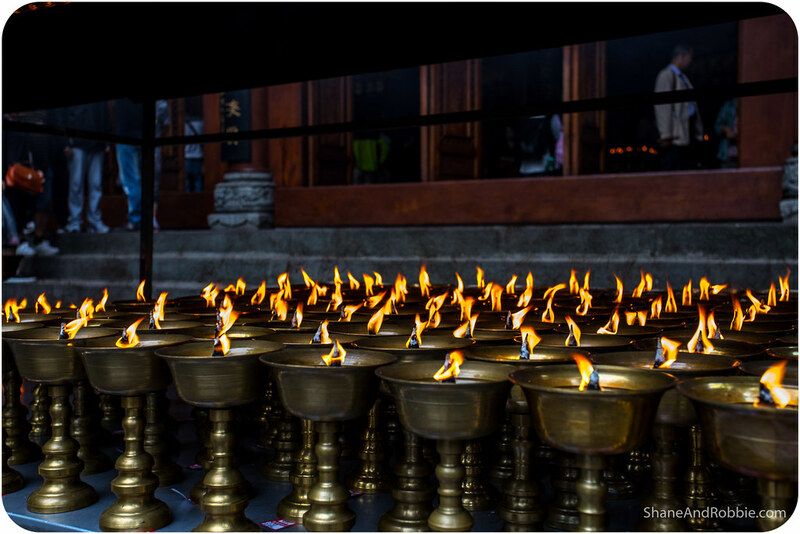 *According to Buddhist faith, Maitreya is an incarnation of Buddha that will appear on Earth in the future to remind people about dharma after the teachings of Gautama Buddha have been forgotten. 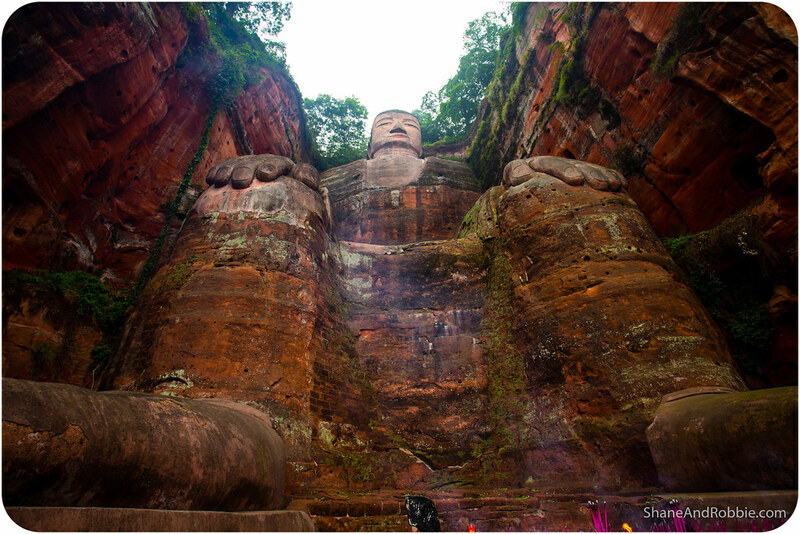 Construction of the Leshan Giant Buddha was undertaken at the behest of a Chinese monk called Haitong. 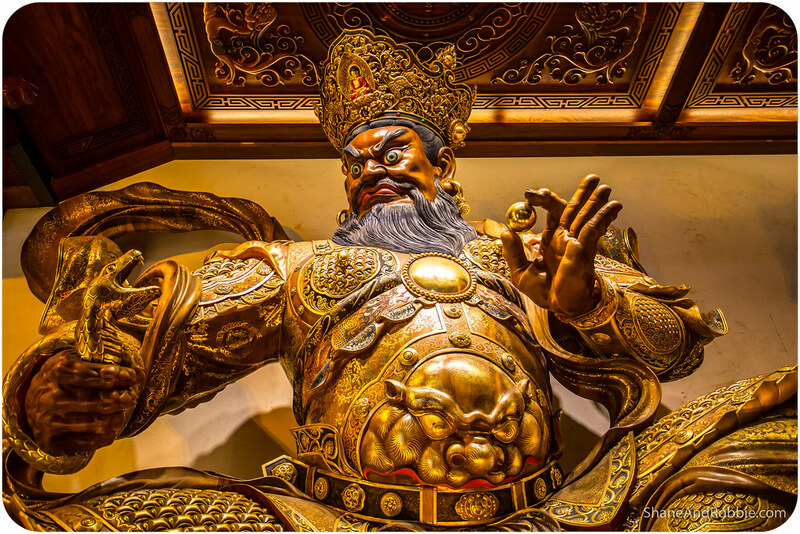 Troubled by the number of people being killed during times of heavy rainfall, Haitong had a vision that building a giant statue of Buddha at the site where the Minjiang, Dadu and Qingyi Rivers met would reduce the flooding and protect the people of Leshan. The project was begun in 713AD but unfortunately Haitong didn’t see his vision to completion as it took 90 years to complete the carving. 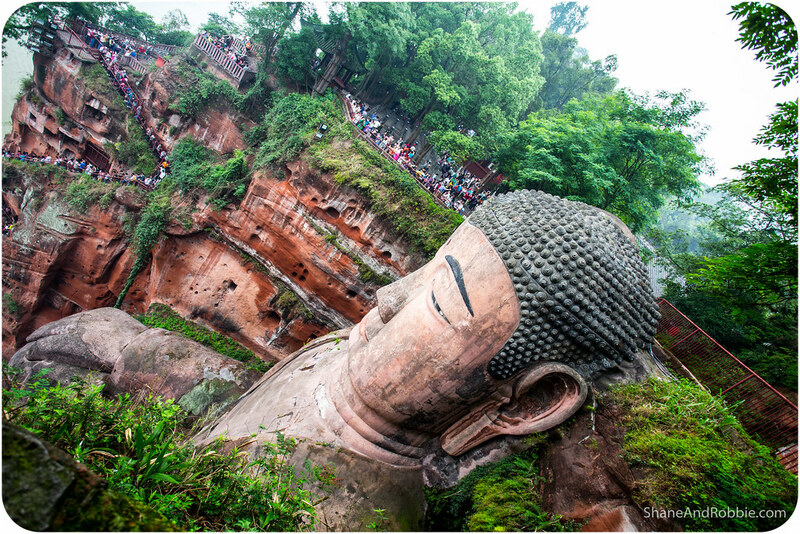 Since the Buddha was complete Leshan has been protected from flooding, which does make it seem like the Giant Buddha really is protecting the town. Sceptics, however, have pointed out that rather than any divine intervention, there is a more likely reason why the construction of the Giant Buddha has helped reduce flooding. It seems the huge amount of stone chipped away from the mountain was deposited into the rivers’ confluence, forever altering the flow of the water just enough to reduce the flood risk. Even with this more realistic explanation in mind, it seems Haitong’s vision was correct! Having gotten ahead of the Chinese tour groups, we clambered up the 300 or so steps to survey the Giant Buddha from upon high. With his 6.72m long ears and 5.22m long nose, his impassive face loomed large in front of us. We then joined the line of people waiting to navigate the narrow staircase down the side of the mountain. Negotiating steep steps with 4,000 of your new Chinese friends all pushing, shoving, and elbowing you in the face is not my idea of fun. We were supposedly making our way down the stairs so we could enjoy views of the Buddha from different perspectives, but all it did was give me crowd- and vertigo-induced anxiety. It also made me want to hurl a couple of small Chinese grandmothers over the cliff-face for their obnoxious and over-zealous use of elbows. The Chinese version of “orderly public behaviour” is markedly different to what we’re used to, that’s for sure! When we finally got to the bottom of the steps we spent some time gazing up at the enormity of the Buddha, wondering what the benevolent deity would think of all these crazy little creatures crawling all over him like ants. As awesome as the Giant Buddha was, it was actually a relief to leave him behind and make our way back up the mountain (via a different set of steps) to the temple built in Haitong’s honour. 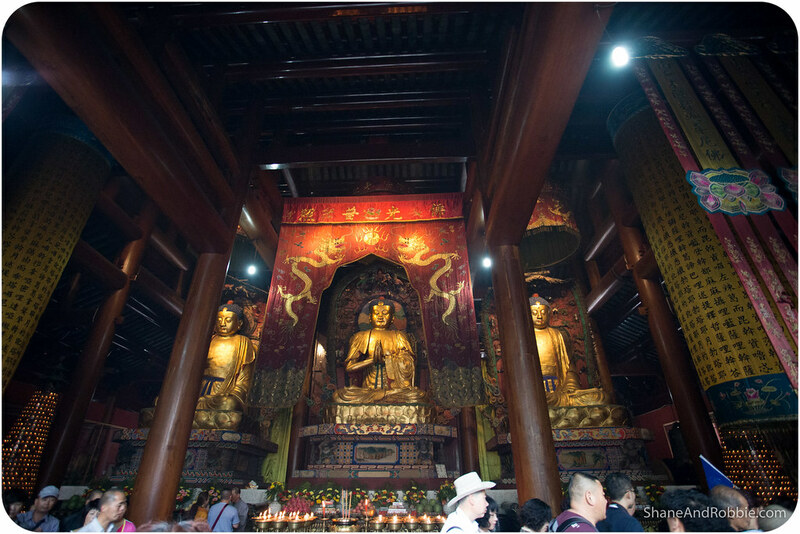 The temple was small and simple (by Chinese standards), with a front hall that housed 4 elemental guardians* and a main hall that contained the seated image of Buddha, looking out across the forest. *Chinese Buddhist temples contain 3 buildings separated by courtyards. The front hall contains 4 large wooden statues, 2 on each side. These are known as the Guardians of the Four Directions and represent the different directions of the compass and the elemental forces of wind, water, fire and earth. 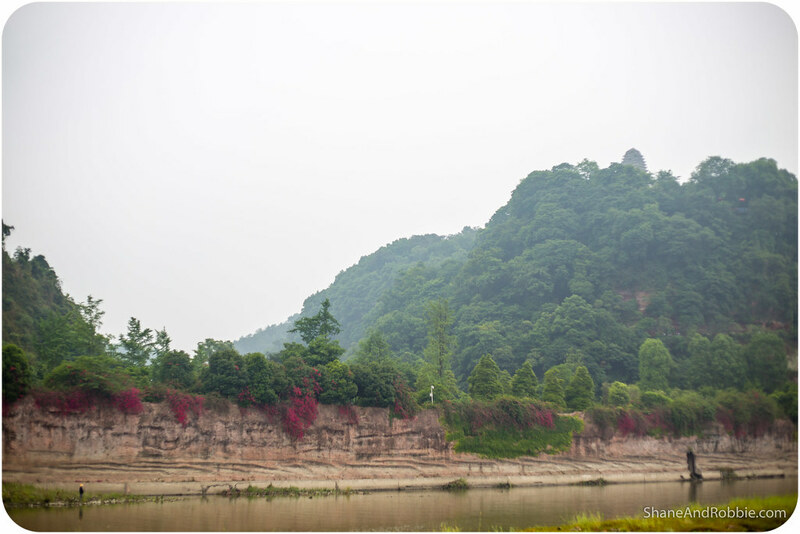 Having toured through the temple and enjoyed some peace and quiet in the temple grounds we walked around to a boat pier where a vessel took us across the river to the thriving modern town of Leshan. The air was incredibly hazy*, making it seem like dusk despite it being middle of the day! *It’s ALWAYS hazy in this part of Sichuan as all the air pollution from Chengdu’s factories and car exhausts mixes with the low cloud and just sits in the Sichuan Basin. This creates an eerie ambient haziness that blocks the sun from view and leaves us wondering how the people here don’t end up with rickets from lack of sunshine. A delicious (but SPICY) late lunch in Leshan left us replete and snoozy for the drive back to Chengdu. The views along the way were pretty uninteresting, with factories being the dominant form of “scenery”. The best part of the trip back was chatting to Summer and our driver Jerry (not his real/Chinese name) about how things in China work in terms of education, healthcare, work, taxes, buying houses, marriage, and retirement. We had a good chat about the difference in value placed on the external appearance of things here in China versus in Australia. It’s one of the things we have noticed from the beginning: the look of things matters a lot here; in fact, appearances matter the most. People invest tremendous effort and funds on their appearance, the car they drive, and other external signs of success. We’ve also seen buildings/businesses that display a façade of grandeur, behind which often lies a not-so-grand interior. This has caught us out a few times as we’ve made a choice about things like what restaurant to eat at based on its external appearance, only to discover the interior is….different to what was promised. This is one aspect of Chinese culture that we’ve really noticed because it’s so different to Aus – outward appearances are pretty much the LEAST important thing for most Aussies! The funniest consequence of this difference in value systems is watching how Chinese people look at us when we’re out sightseeing. Invariably Chinese tourists are impeccably dressed, with designer handbags, beautiful outfits, and expensive accessories. They look the picture of sophistication and gentrified success. We, on the other hand, look like scruffy bums. And oh the looks of consternation we attract when we step out of our touring car with our personal guide to take us around for the day! It’s like the Chinese tourists cannot fathom how 2 obviously poor people (why else would we dress so BADLY?! ), could possibly afford to be on holiday here in China! Very amusing. 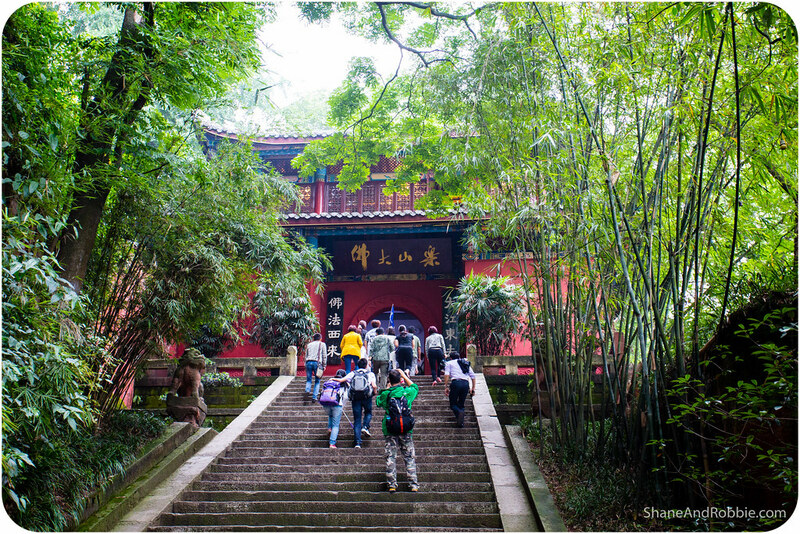 For now however, our day of sightseeing around Leshan at an end, we’re now back in Chengdu. We’ve got another ridiculously spicy Sichuan meal (that was NOT spicy by their standards) in our bellies and our minds are full of giant Buddhas and fast flowing rivers.